Here we are again- Earth Day. I have posted this cartoon every Earth Day since I began the blog in 2006. It is, of course, by one of America’s greatest philosophers, Walt Kelly, creator of the comic strip, Pogo. Since the first Earth Day in 1971, the phrase, “We have met the enemy and he is us” becomes more and more profound. The climate change deniers,the Koch brothers and their lackeys who fight solar and wind power and all other alternative sources that cut into their oil and coal profits, have become more powerful and, because of their money, more influential. A clear eyed appraisal of the current situation would say that we are beyond the point of no return. The enemy has won and we can only watch the carnage we have brought upon the “forest primeval”. Today is Earth Day once again. Earth Day 43 hardly rates a comment in the main stream media. Why? Well, it is likely because the world continues to slog forward refusing to make any meaningful change. Climate change deniers are still taken seriously. 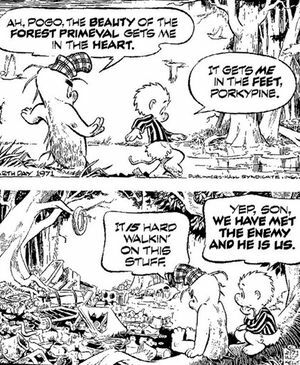 Walt Kelly’s great insight that we have met the enemy and he is us, explains it all. Here we are again. Earth Day 38. Have things changed since Walt Kelly and Pogo reminded us that we have met the enemy and he is us? Well yes, we have at least come to realize the problem. Unfortunately, it is unlikely that we have the political will to make the necessary changes in time. In that journey we are on, we are still just taking the first baby steps. Today is the 36th Earth Day and the famous Pogo cartoon celebrating the first earth day is more appropriate than ever. Walt Kelly, the author of the Pogo comic strip, was a brilliant cartoonist and political satirist. Pogo first appeared in the 1950’s during the McCarthy era and continued through the Nixon presidency. Pogo was the first newspaper comic strip to engage in biting political satire and he often faced harsh complaints from those he was criticizing, and their supporters. As a result (as is the case with Doonesbury today), some papers dropped the strip while others moved it to the editorial page. A number of years ago, my wife gave me a framed and signed copy of the “Earth Day” strip and it hangs above the desk in my office. It serves as a constant reminder of the responsibility each of us has in a democracy. Walt Kelly was a writer as well as a cartoonist and he understood the quote to be more than just a comment on the environment. Here is what he said in the introduction to “The Pogo Papers,” published in 1953, nine years before the Earth Day strip. “In the time of Joseph McCarthyism, celebrated in the Pogo strip by a character named Simple J. Malarkey, I attempted to explain each individual is wholly involved in the democratic process, work at it or no. The results of the process fall on the head of the public and he who is recalcitrant or procrastinates in raising his voice can blame no one but himself. Traces of nobility, gentleness and courage persist in all people, do what we will to stamp out the trend. So, too, do those characteristics which are ugly. It is just unfortunate that in the clumsy hands of the cartoonist all traits become ridiculous, leading to a certain amount of self conscious expostulation and the desire to join battle. On this Earth Day, and in tribute to Walt Kelly, let us each find ways to make our tiny blasts on our tiny trumpets. A good place to begin would be to read the Earth Day Network’s Top 10 Actions to Combat Climate Change. And pass it on to friends.